Along with books and music, my other true love is food. I love cooking, baking, and above all, eating. Cookbooks are scattered throughout my house, and I love to read food-related magazines and memoirs. 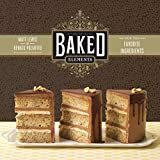 Baked Elements: Our 10 Favorite Ingredients is the cookbook currently open on my counter as I attempt to recreate the Brooklyn bakery's fantastic desserts. McSweeney's food quarterly Lucky Peach, now in its fifth issue, is my favorite periodical. I drop everything when it arrives and read it, nonstop, from cover to cover, every issue has fascinated and informed. To enter this week's contest, leave a comment naming a musician and an author (living or dead) that you would like to have over for dinner for a chance to win these two books and a $100 Threadless gift certificate. The winner will be chosen randomly at midnight ET Friday evening (February 22nd).